Dr. Kevin Hu has been devoted to health care career for more than 30 years. 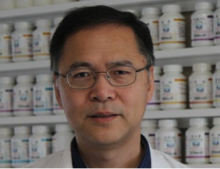 He has practiced, researched, taught Chinese herbal medicine, acupuncture and western medicine since 1986 in China and has been teaching in Canada since 2004. He has a PhD in Medicine from China and a Doctor of Chinese Medicine from the 1st Affiliated Hospital of Guangzhou University of TCM, where he later served as professor. He was a physician of integrative Chinese and Western Medicine in Changhang General Hospital. In the past 30 years, he successfully treated thousands of patients suffering from various kinds of diseases, acute and chronic, simple and complicated, like heart failure, arthritis, amenorrhea, infertility, depression and chronic pain syndromes. He is highly experienced in treating severe, chronic and complicated conditions. He currently runs his busy BayVan Clinic in Victoria.